If you’re a chocolate lover then be warned! 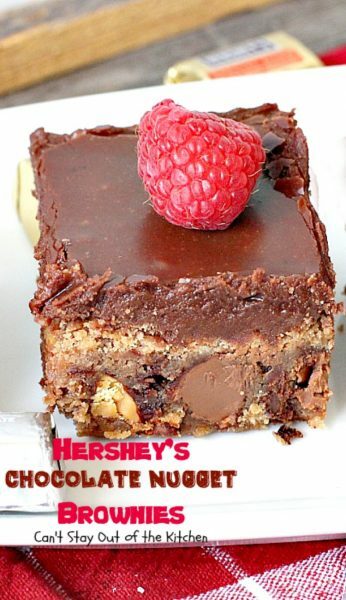 Hershey’s Chocolate Nugget Brownies are addictive, decadent, sinfully rich and over-the-top on chocolate because even though there is so much chocolate in the brownie, I’ve also added a chocolate fudge icing on top. Wow! 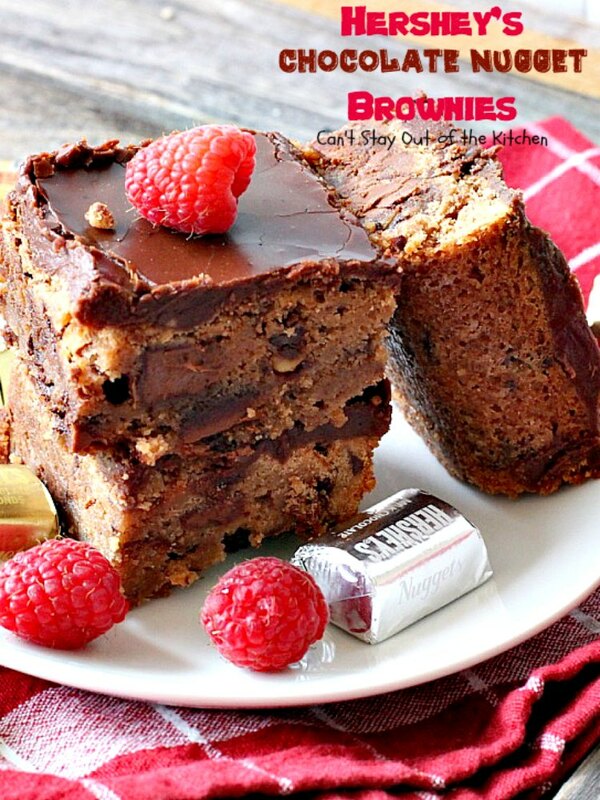 These brownies really should be called DEATH by chocolate! 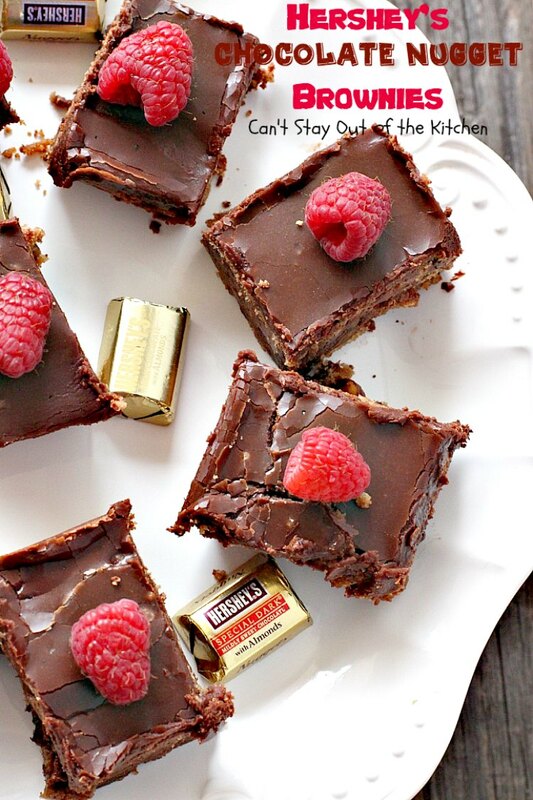 Seriously, these brownies are spectacular, and truly a great way to use up holiday candy. I had a huge 38.5-oz. bag of Hershey’s Fun Mix leftover from Christmas that I’ve kept in the refrigerator and really needed to use up. Duh! 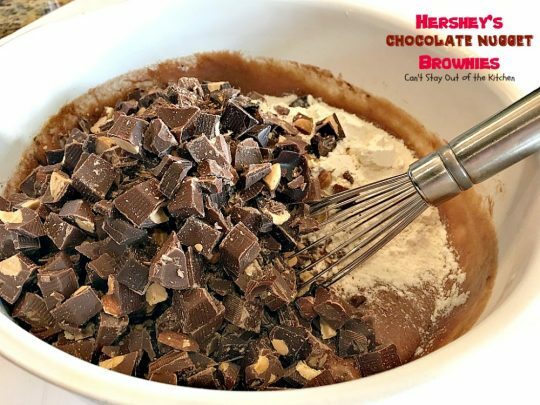 This blend has Hershey’s Nuggets & Toffee with Almonds, Hershey’s Nuggets with Milk Chocolate & Almonds, Hershey’s Nuggets Special Dark Chocolate with Almonds, and Hershey’s Nuggets Milk Chocolate. A-M-A-Z-I-N-G doesn’t even begin to describe how these luscious brownies smelled when I was baking them let alone as I was cutting them up a few hours later. 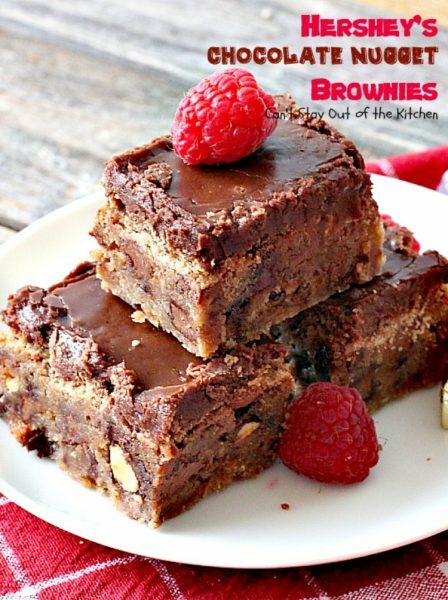 If you’re needing a chocolate fix, then making up a batch of these delicious brownies will certainly do it. The nice thing about these brownies is they’re loaded with that great Hershey’s nugget and almond taste. Then, to add fuel to the fire, I’ve added a chocolate fudge icing. I recommend eating this fabulous bar in small quantities so you don’t pass out from all the sugar! 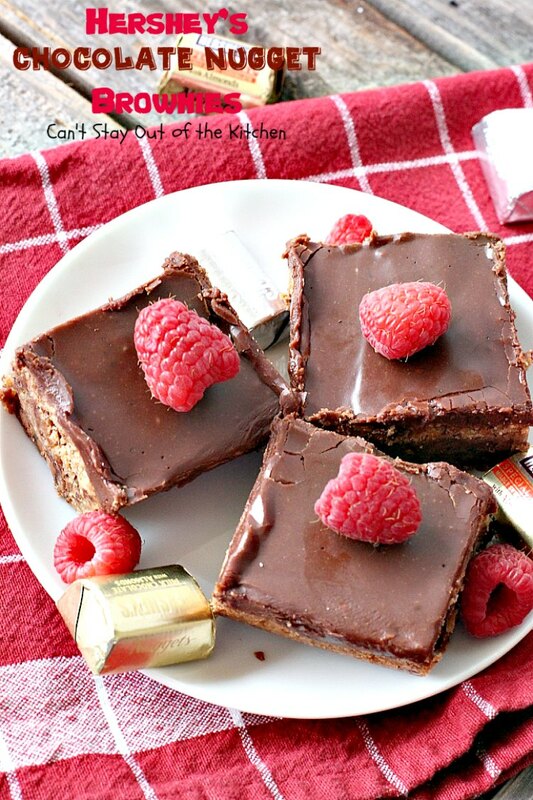 You don’t have to add the icing, but…..well, if you’re going to indulge you may as well add the icing! 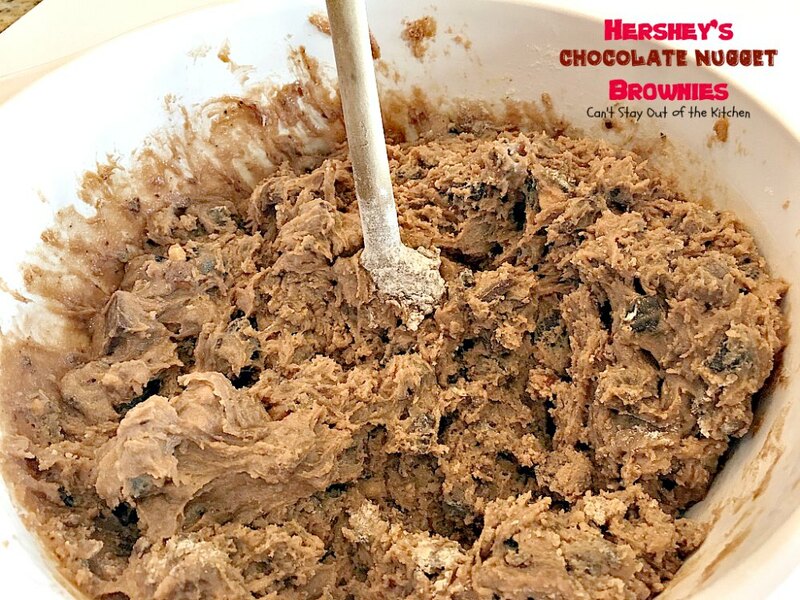 When I originally published this recipe back in July 2013, I was taking pictures late in the day, so the sun was setting and all my pictures ended up with somewhat of a golden tint to them. Not really what I was hoping for. I recently remade this recipe (January 2017) and changed it up from my initial recipe. Instead of melting the candy bars, I used Ghirardelli chocolate instead and then just chopped up the candies and added them in like chocolate chips. I actually thought they turned out better this way. 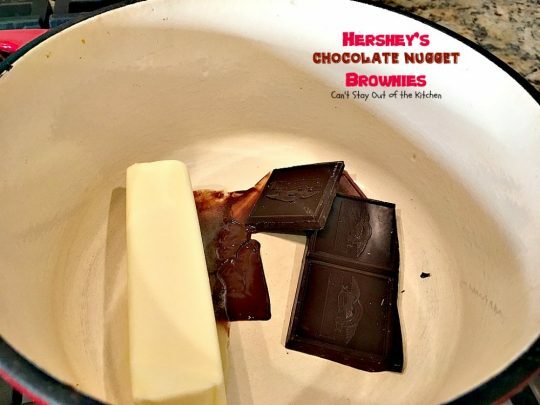 Hershey’s Chocolate Nugget Brownies are still incredibly delicious and sure to cure any sweet tooth craving you’re having! I share them as part of my Christmas Cookie Extravaganza for 2016. Hershey’s Chocolate Nugget Brownies are incredibly rich. Be prepared for DEATH by Chocolate! 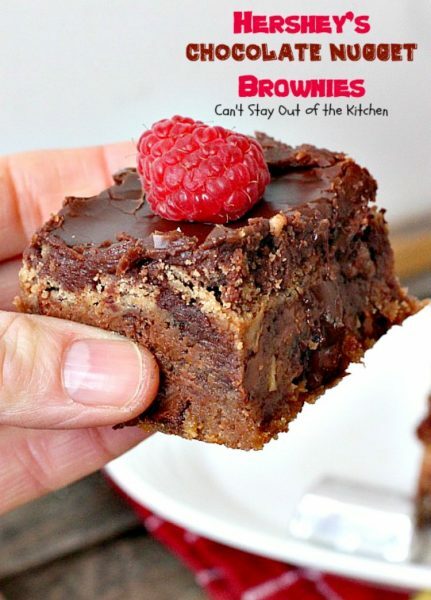 The Chocolate Fudge Frosting on top of the brownie only adds to the decadence! Don’t these brownies look scrumptious? Don’t torture yourself, go ahead and try one! 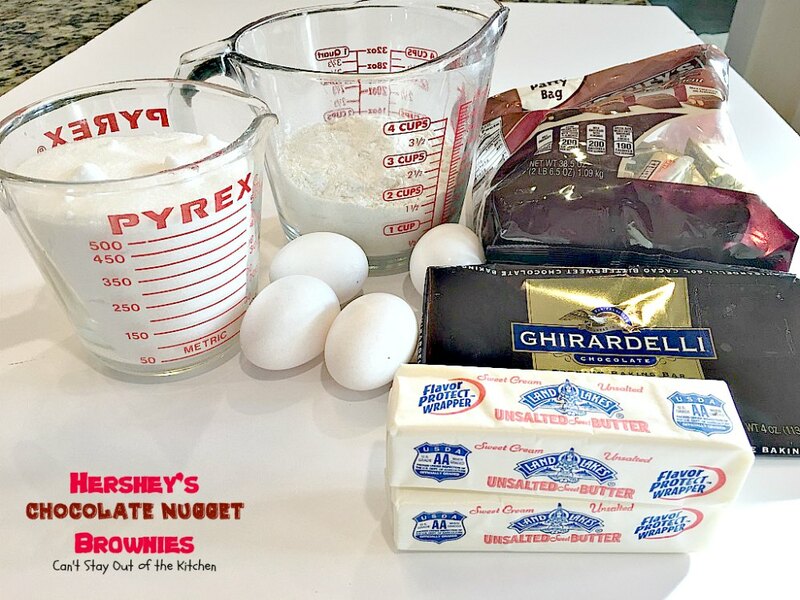 I found these brownies a little easier to cut by refrigerating them about an hour first. 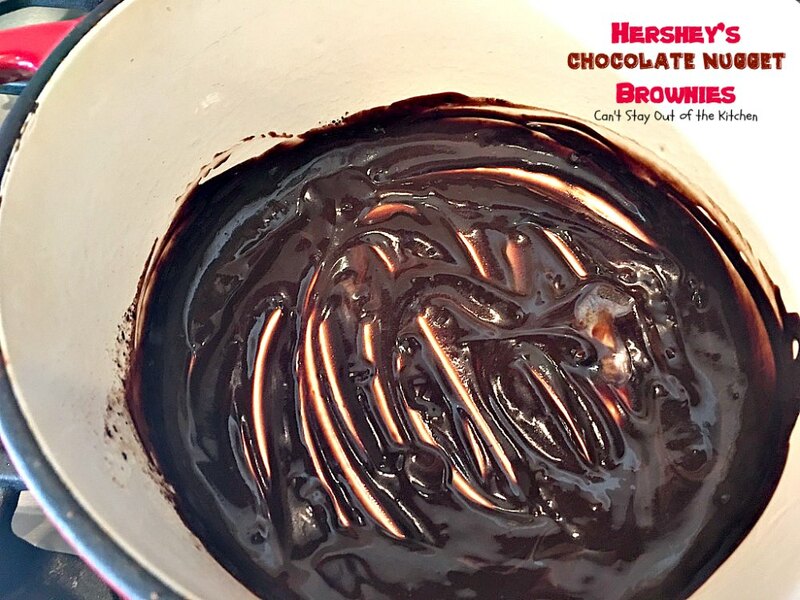 Melt Ghirardelli chocolate and butter in a small saucepan over low heat. Cool slightly. Meanwhile in a mixing bowl, whisk eggs, softened butter and sugar together. Add cooled chocolate mixture to egg mixture. Add UNBLEACHED all-purpose flour. Bleached flour toughens baked goods. 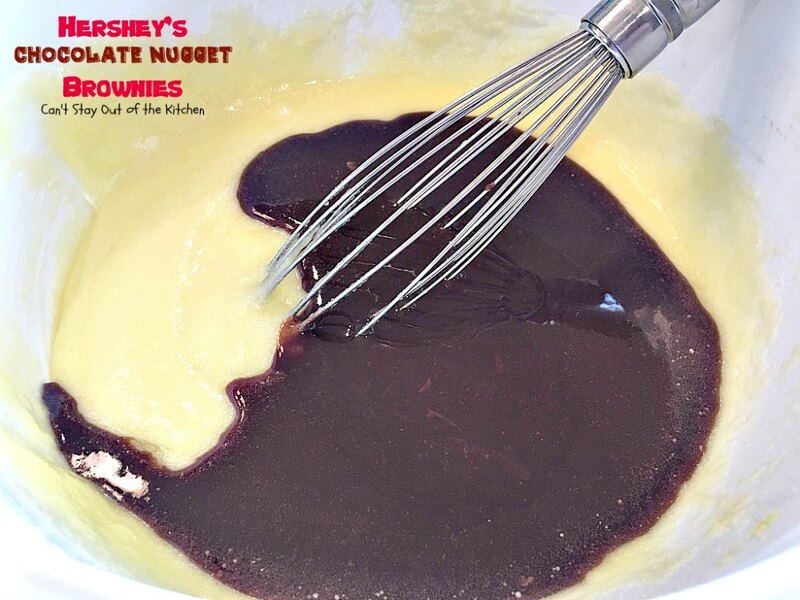 Add coarsely chopped Hershey’s Nuggets. Spray a 10×15″ glass baking dish with cooking spray. 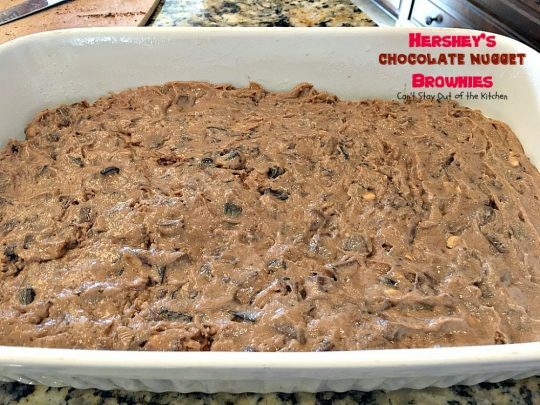 Spread brownie batter into prepared dish. Bake at 350 about 35-45 minutes or until toothpick inserted in center comes out clean. Cool brownies completely. To make Chocolate Fudge Icing: Melt butter in medium saucepan and add cocoa. Stir to combine. Make sure heat is on low. Add powdered sugar and begin to whisk. Add milk. Add vanilla and salt. 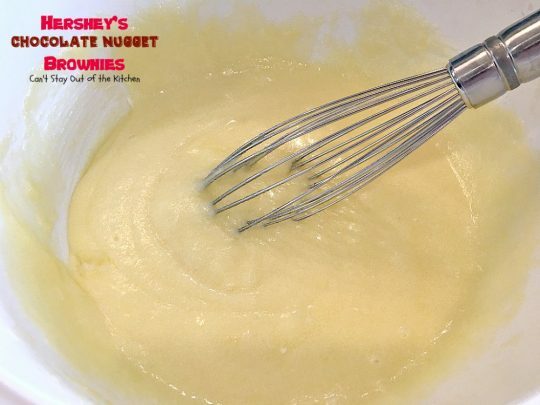 Whisk ingredients together and turn off heat. Spread icing rapidly over the brownies. 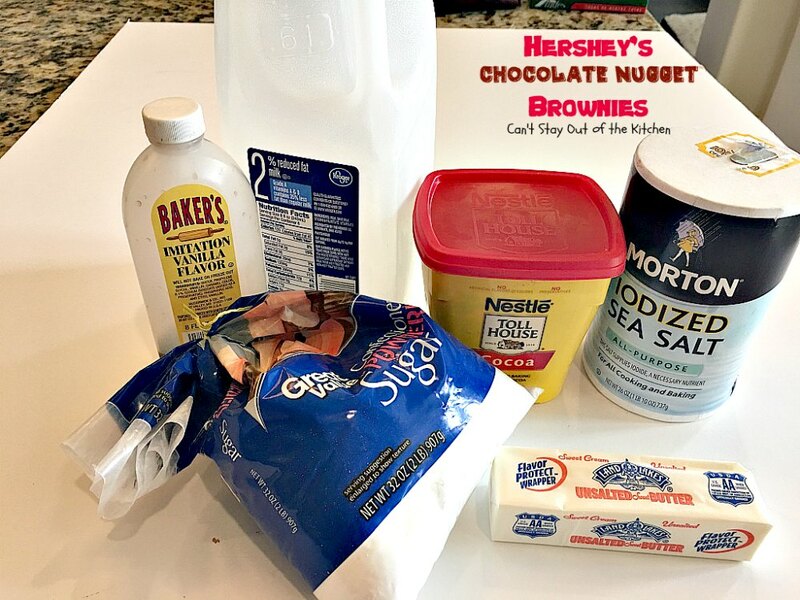 The fudge will harden quickly so you have to spread the icing fast. Allow the icing to set before cutting. These are easier to cut if you refrigerate them an hour or so first. Don’t refrigerate them too long or you won’t be able to get a knife through to cut them! 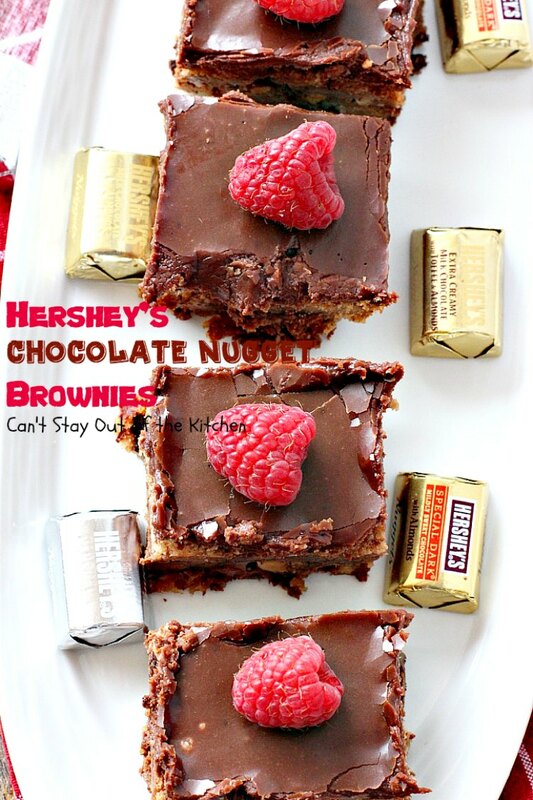 Hershey’s Chocolate Nugget Brownies are addictive. They are so very rich and sweet. 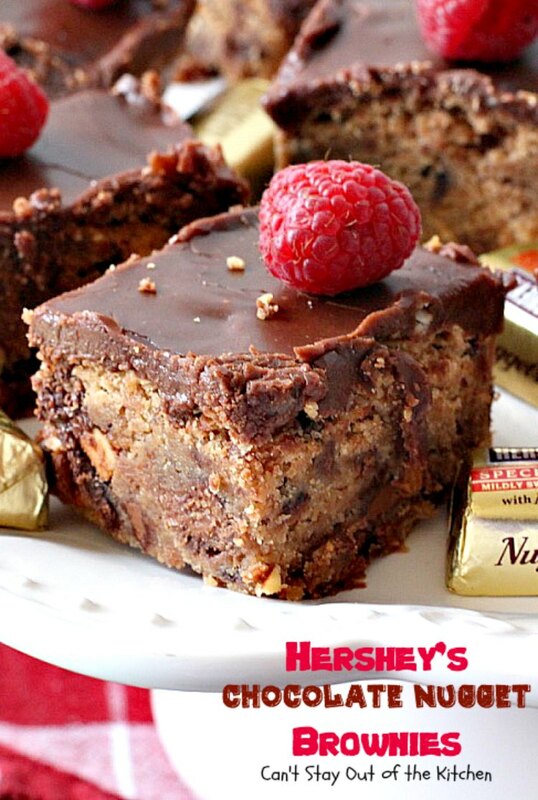 Making a batch of Hershey’s Chocolate Nugget Brownies is a great way to use up holiday candy. Once the icing is dry, these bars actually stack quite nicely. 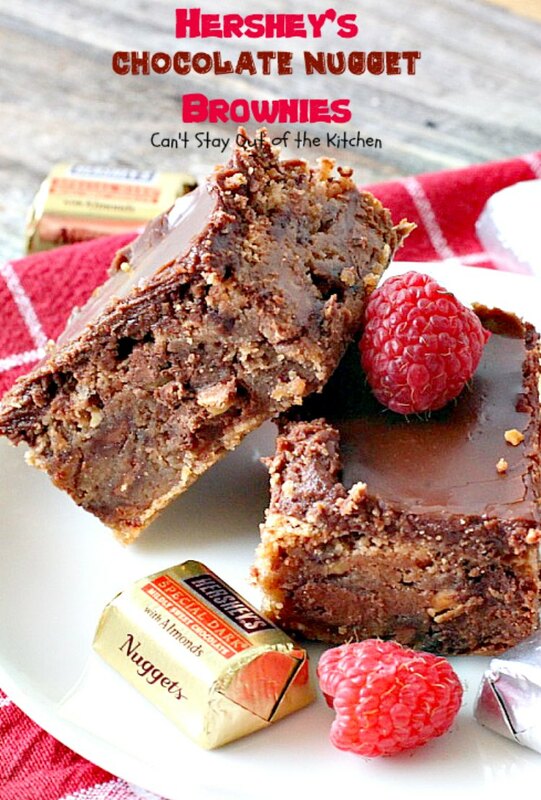 If you take a plate of these brownies on your next family outing they will be gone very soon. 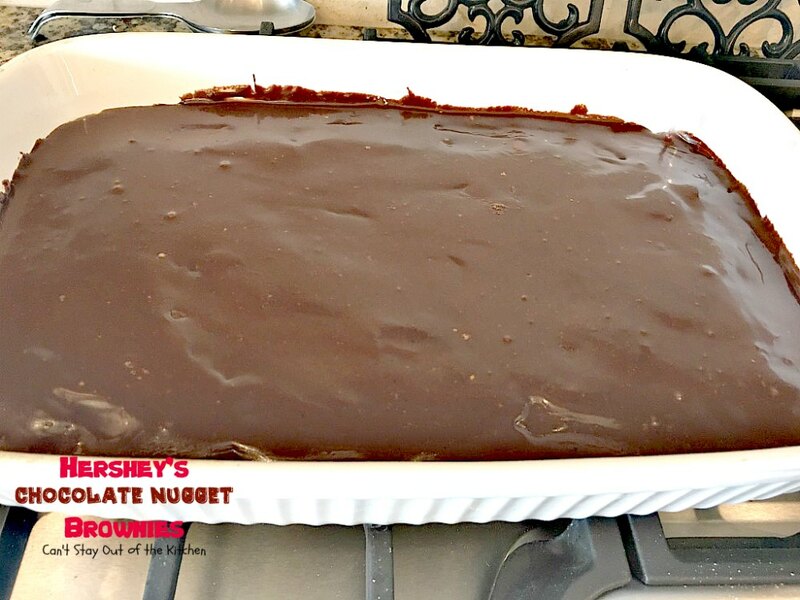 Hershey’s Chocolate Nugget Brownies are great snacks to take to picnics, potlucks, or office parties–that is, if you want to share them! 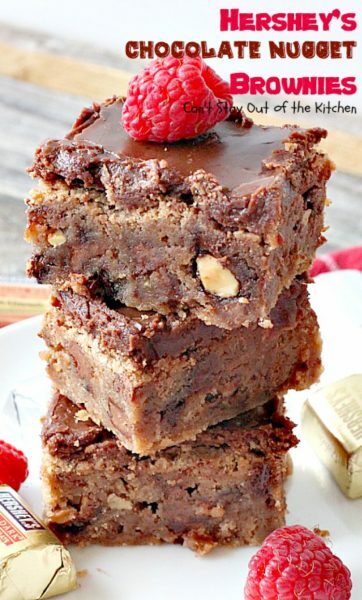 The nice thing about these brownies is they have some of the dark roasted chocolate included with all the chocolate so that gives the brownie a richer, deeper flavor than otherwise. 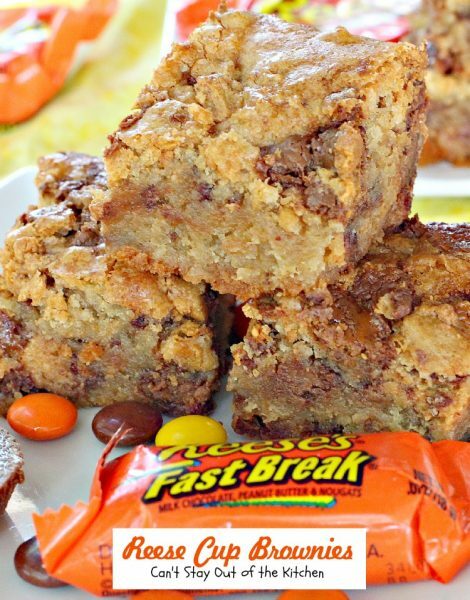 Delicious way to use up Halloween candy! This brownie recipe uses Hershey's Nuggets with Almonds and then is frosted with a chocolate fudge icing. Unwrap chocolate candies and coarsely chop. Place 8 tablespoons unsalted butter and Ghirardelli chocolate in saucepan over low heat. Place eggs, sugar, and softened butter in a large mixing bowl. 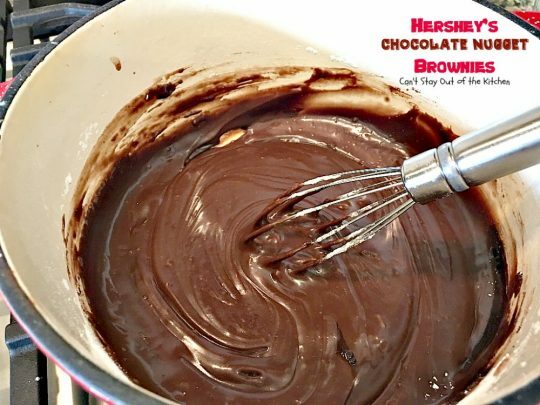 Add chocolate mixture and whisk again. Stir in flour and chopped Hershey’s Nuggets with a wooden spoon to combine. Pour into a 10x15” glass baking dish that’s been sprayed with cooking spray. Bake about 35-45 minutes or until a toothpick inserted in center comes out clean. Spread with Chocolate Fudge Icing. Place butter and cocoa in a small saucepan over low heat. Add powdered sugar, milk, salt and vanilla and whisk until combined. This is a fudge-type icing so you will have to work quickly and smooth icing over the brownies before the icing hardens. Once brownies are cooled completely, spread fudge icing over top of brownies and smooth icing with a knife to the edges. Allow icing to cool completely and harden before cutting. NOTE: I can't emphasize enough how quickly you must spread this icing. Once the icing cools, it hardens too much and will not spread. You will have to reheat it to soften it again if this happens. NOTE: I recommend refrigerating the bars about an hour before trying to cut them. Delicious way to use up Halloween candy! 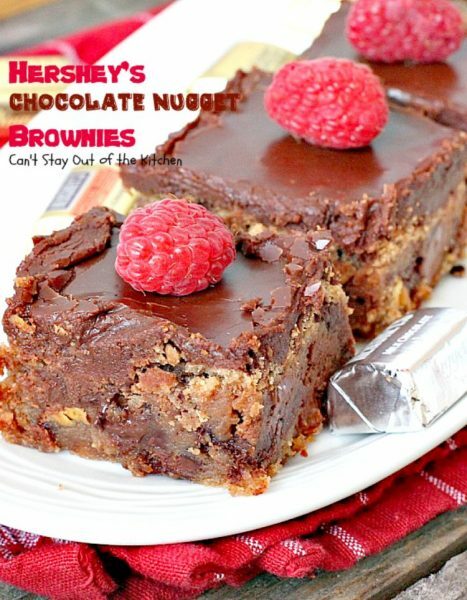 This brownie recipe uses Hershey’s Nuggets with Almonds and then is frosted with a chocolate fudge icing. Unwrap chocolate candies and place in medium-sized saucepan over low heat. Add 5 1/3 tbsp. butter. 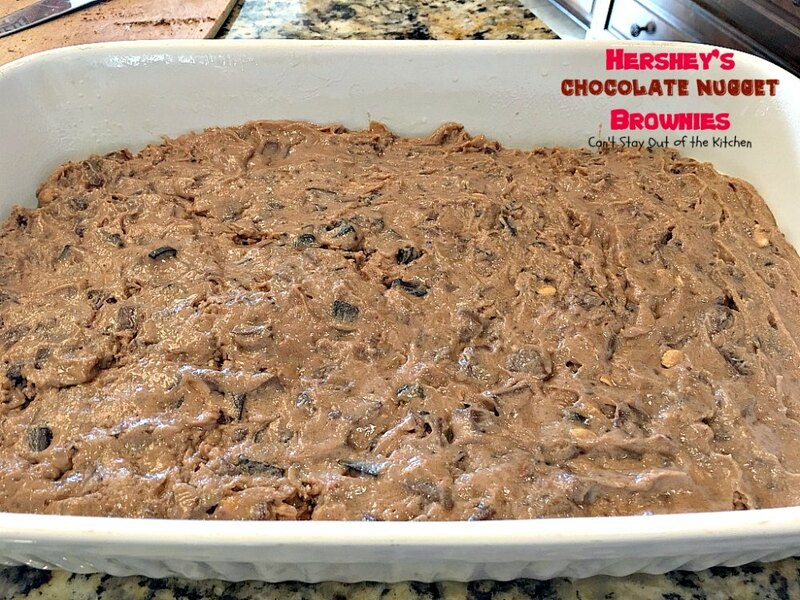 Place in large mixing bowl with eggs, sugar, and softened butter. 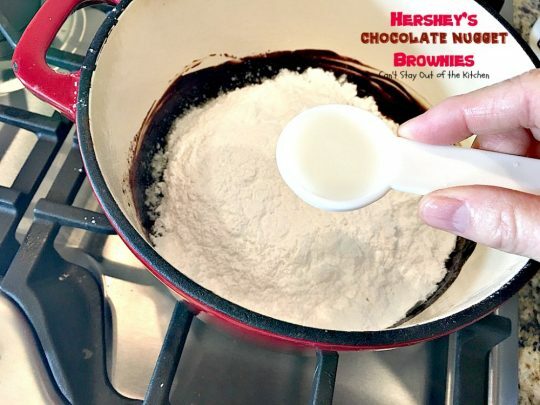 Stir in flour with a wooden spoon to combine. Pour into a 9×13” glass baking dish that’s been sprayed with cooking spray. I can’t emphasize enough how quickly you must spread this icing. Once the icing cools, it hardens too much and will not spread. These brownies are extremely rich. You may want to cut them up even smaller than these pieces are! If you like chocolate, you will LOVE these fantastic brownies! If you ate this many in one sitting, you probably would pass out! Hershey’s Chocolate Nugget Brownies are a great treat for your family. Hershey’s Chocolate Nugget Brownies are a real crowd-pleaser. It’s time to eat one of these jewels! Thanks for linking to my sweet potato brownie recipe 🙂 your recipe sounds delicious. I may have to try a gluten free version of it! You’re welcome. It looked great! Hi Teresa, you won’t believe this but I can’t even bake boxed brownies, but I am going to get Mark to make this for me. Again a wonderful recipe and I love your photos. Thanks for sharing.